Barbara Humpton is CEO of Siemens USA, where she guides the company’s strategy and engagement in serving its largest market in the world, with more than 50,000 employees and over $23 billion in revenues and $5 billion in annual exports. Most recently, Humpton served as president and CEO of Siemens Government Technologies, Inc. (SGT), a leading integrator of Siemens’ products and services for federal agencies and departments. In this role, Humpton also served as an officer/director member of the board of directors of SGT. 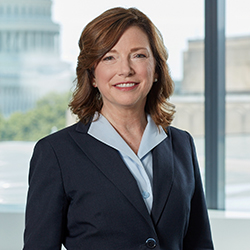 Prior to joining Siemens, Humpton served as a vice president at Booz Allen Hamilton where she was responsible for program performance and business development for technology consulting in the Department of Justice and Department of Homeland Security. Earlier, Humpton was a vice president at Lockheed Martin with responsibility for critical programs such as the FBI’s Next Generation Identification and the TSA’s Transportation Workers’ Identification Credential.